Delays and cancellations continue in many parts of Europe because of the snowstorm. The worst part has taken Gatwick international airport, which is closed since yesterday until further notice because of the complicated weather conditions. A total of 35 flights were canceled between Spanish airports and London following the closure of Gatwick Airport because of heavy snowfall in the last hours in the city. Yesterday were canceled 79% of flights between Spanish airports and London, 34 arrivals and 30 departures. 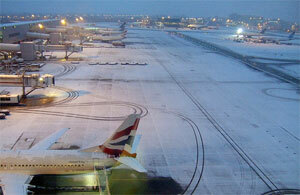 Snow and freezing temperatures continue to disrupt air traffic in Europe. Gatwick airport will be closed all day, as happened yesterday, and others which have closed during the night, are scheduled to open during the day. At Frankfurt airport, the largest in the continent, have been canceled already 40 flights, 25 landings and 15 takeoffs for today, according to a spokesman. There are also regulations with other European airports because of the weather situation, particularly in Brussels, Frankfurt, Hamburg, Manchester, Cardiff and Amsterdam. The airports Gatwick, Edinburgh (Scotland) and Geneva (Switzerland) are closed, while the Frankfurt and Munich airports (Germany) had to cancel many flights for the second day and Brussels is behind schedule. The German Weather Service warned yesterday that the cold weather and snow will last at least until the weekend and temperatures will drop further. Great Britain suffers the worst snowstorm before winter in two decades. The rail traffic is also being handicapped by the snow. The company Eurostar recommends travelers to postpone their travel.